Harrison KennedyHarrison Kennedy was born in Hamilton, Ontario, Canada: his father was a black American/Sicilian while his mother was of black American/Irish descent - a somewhat explosive mixture! His grandmother told the stories of slavery and many of his family live up north. His early interest in the blues was fuelled by what he heard on record, radio and on his �blues & booze� trips across the border in Buffalo. While at university he learnt guitar and harmonica and joined a rhythm & blues band �Stone Soul Children�. One of the band�s female singers was due to travel to Detroit to audition for Holland Dozier Holland and Harrison went along for the ride. It was Kennedy who received the �phone call from H.D.H� inviting him to join �Chairmen of the Board� and record on their new label Invictus. The group was, of course, hugely successful with a string of million sellers including �Give me just a little more time�. Invictus also issued a solo Kennedy album �Hypnotic Music� a non commercial outing which showcased his own compositions. Shortly after this the financial debacle of Invictus Records abruptly finished this chapter of his career. Disillusioned Harrison left the music scene for a while and worked first as a millwright and then as a foreman at Allied Chemical near Detroit. In 1982 he started playing again working the R&B/blues & jazz circuit. Returning to Canada in 1998 Harrison Kennedy received the Reverend John C Holland�s Arts and Culture award and has subsequently built up a solid reputation as a blues and R&B veteran performing regularly with his group or as a solo. In 2002 he recorded the CD �Sweet Taste� which was nominated for a Juno Award and earlier this year he recorded a new CD for Black and Tan which has received considerable critical acclaim leading to an invitation to record a show for Andy Kershaw. 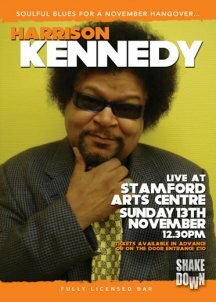 The scope of Kennedy original compositions showcase the chameleon quality of his voice which is at ease performing blues, gospel, R&B, funk and soul.